The F84E had a J35-A-17D engine, Sperry AN/APG-30 radar-ranging gunsight, retractable attachments for RATO bottles, inboard wing hardpoints made "wet" to permit carrying an additional pair of 230 U.S. gal (870 L) fuel tanks. Most aircraft were retrofitted with F-84G-style reinforced canopies. The fuselage was stretched 15" over the F-84D; the canopy was lengthened 8", the canopy frame was lengthened 12" (accounting for another 4"), and a 3" splice panel was added aft of the canopy. The stretch was not done to enlarge the cockpit but rather to enable a larger fuel tank, provide additional space for equipment under the canopy behind the pilot's seat, and to improve aerodynamics. This can be distinguished from earlier models by the presence of two fuel vents on ventral rear fuselage, the added radar in the nose splitter, and the pitot tube was moved downward from mid-height in the splitter (as on the F-84D) to clear the radar installation. 843 built. F-84E 49-2031 was a test aircraft for air-to-air missiles. F-84E 50-1115 was a test aircraft for the FICON project. ProModeler originally released an F-84G in 1999, but those of us who checked it out realized that it was designed to do the E as well, even if the parts were not in the box. This one is typical of Revell's relatively flimsy boxes, but at least it is thicker than the recent G release and doesn't require the extra cardboard stiffener installed to help protect the parts. 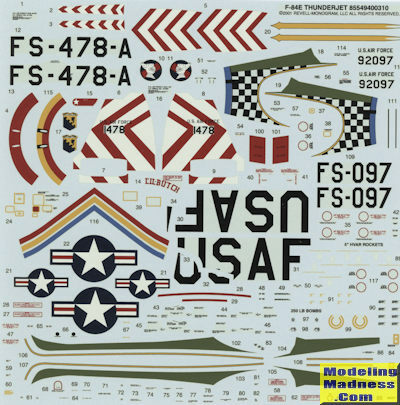 Since Revell USA does not provide a parts diagram, you won't see a layout with this one. Suffice it to say that it is an engraved panel line kit and actually, looks quite nice. Perhaps not Tamiya nice, but still quite presentable. This kit does not include the sprue that came with the F-84G so no nuke, but it does contain the new forward fuselage section without the blow-in doors and does come with the proper speed brake. It also has a different rear fuselage piece so I'll take a leap of faith and consider this part to be different. It also provides a different upper wing insert without the air refueling door. Moving to the wings, the tip tanks are molded in place and have refueling probes molded in. You will find photos of the E without these probes or perhaps only on one side so check references. The builder will need to open holes for the rocket rails. The ones for the inner pylon, which could carry either fuel tanks or bombs, is already open. The main gear wells are built up of several pieces. The inner well includes the inner gear doors. Outer doors are separate units that attach to each other then the main gear strut. Torsion links and retract struts are included. The speed brake well is separate and allows the speed brake to be posed either raised or lowered. These would often bleed down when on the ground. Separate flaps are provided and while you can pose them down, pretty much all the period photos you see of the plane have them raised. The kit does come with two canopies. One is the braced version that is normally seen on Korean War planes and the other is a smooth one used before the brace mod. While the brace on the real plane is on the inside, there are external frame lines so you can properly paint it. The kit also comes with RATO bottles, something the G does not have. Instructions are well done with generic and FS595 paint colors provided. Two overall unpainted metal planes are provided on the very large decal sheet. One is the box art plane from the 31st FG in 1949 and the other is with the 9th FBS/49 FBW in Korea during 1952. Most modelers will probably gravitate towards this version. The big decal sheet is nicely printed and even provides the olive drab anti-glare panel on the top of the fuselage for those who don't want to paint this area. Aftermarket decals are easy to find if you want something else. The Tamiya kit has a lot going for it, but it doesn't build into an E model. To my knowledge, this is probably the only currently available F-84E in this scale at this time. Thanks to its affordable price tag, it will be a worthwhile model to pick up.